Plant tissues. Protection. Trichomes. Atlas of plant and animal tissues. a) Organ: stem, unicellular papillary trichome. 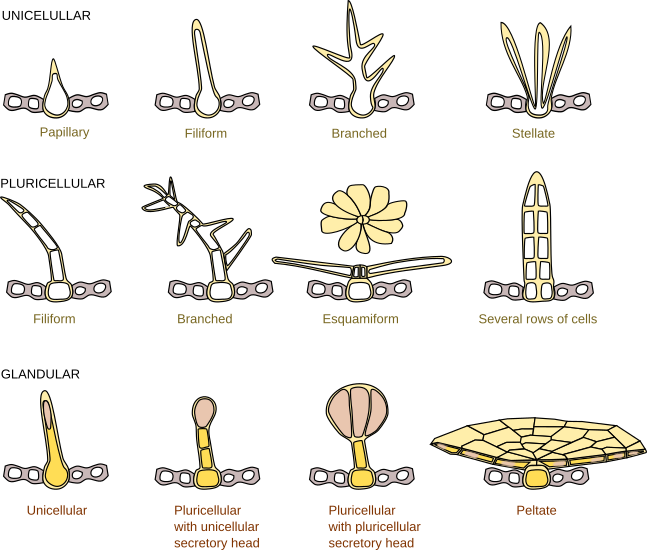 b) Organ: stem, pluricellular and unicellular trichomes. c) Organ: stem, unicellular elongated trichome. Technique: paraffin embedding, section stained with touidin blue. d) Organ: leaf, pluricellular trichome. Technique: paraffin embedding section stained with haematoxylin - eosin. e) Organ: leaf, pluricellular trichome. Many plant species develop many hairs or trichomes in the epidermal layer, although smooth epidermal surfaces can also be found in many plants. There is a wide morphological variety of trichomes, which are classified in two main groups regarding their function: protective and glandular. Both arise from epidermal cells. 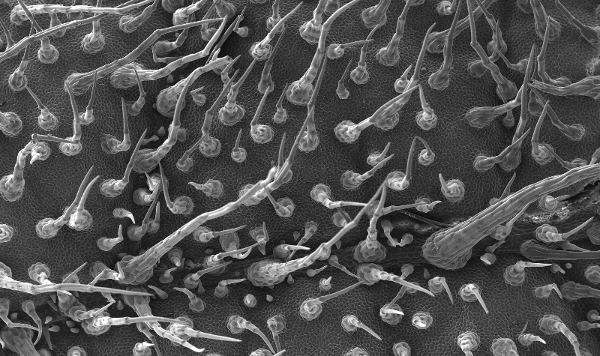 Some epidermal cells elongate to become unicellular trichomes or divide to form multicellular trichomes. 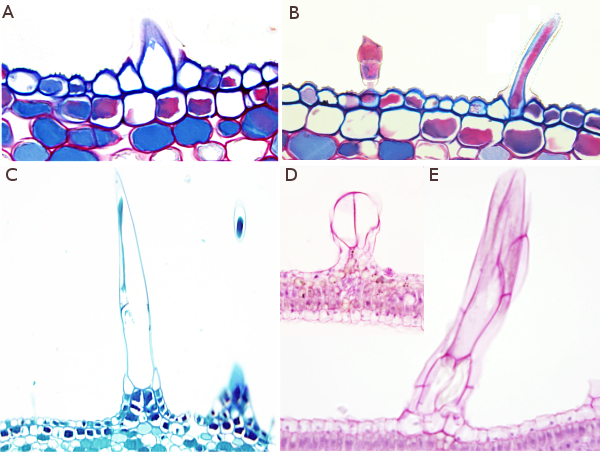 In the figure above, various types of protective trichomes can be observed, both unicellular or multicellular, with different shapes: papillary (A), elongated (B, C and E). However, may also be stellate, branched, etcetera; they may contain living or dead cells, and generally have cuticle. Scanning electron microscopy images from the surface of a kiwi leaf. Trichomes are multicelluar and show different sizes. (Courtesy of Xurxo Mariño Gago. Dept. Plant Biology and Soil Sciences, Faculty of Biology, University of Vigo). Different types of trichomes, including some glandular types.